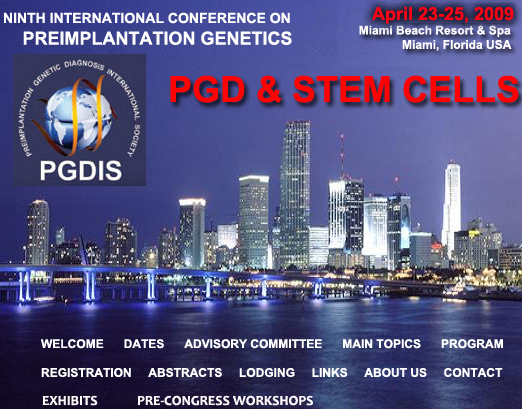 The next, 9th, Preimplantation Genetic Diagnosis International Society (PGDIS) Conference will be held April 23-25, 2009 in Miami, Florida, so this forum returns back to the U.S.A. after the first one in Chicago almost 20 years ago. As PGD is now a much more mature and established technique in genetics practices and reproductive medicine, this Conference will focus on the PGD impact on clinical practice, existing controversies, and its future practical applications. In addition, technical aspects of PGD will be addressed, because a wider application of this still sophisticated procedure may compromise the accuracy and efficacy, requiring appropriate standards of biopsy procedures and of the genetic analysis of single cells. Despite availability of the PGDIS guidelines, based on the most recent developments and experiences from the most active PGD centers, a growing need for training in PGD technical and clinical aspects is evident. So three pre-congress Workshops are organized, including one on preimplantation HLA typing, one on PGD genetic counseling, and another on PGD for IVF, as PGD is presently being used more commonly in the ART practice for selection of embryos with higher developmental potential. One of the special features of the Conference is that it addresses in more detail the issue of human embryonic stem cells. Because PGD has become an important and only source for the establishment of the world’s first repository of human embryonic stem cell lines with genetic abnormalities, the progress in the advancement of research on the primary molecular mechanisms of genetic and chromosomal disorders, and the developments in new regiments for treatment with the use of stem cell therapy will also be reviewed in a special session. In addition to scientific contents, the participants will be able to visit one of America’s truly colorful locales—especially in April, which is the most beautiful month of the year in Miami, South Florida, with sugar-sand beaches, glistening waters of the Atlantic Ocean and world-class attractions. So we are happy to invite you to the Miami Conference, where you will not only be able to participate in the 9th International PGD conference, but also enjoy the spectacular Atlantic Ocean.